Sam Suchoff is cooking up something big in Chapel Hill. 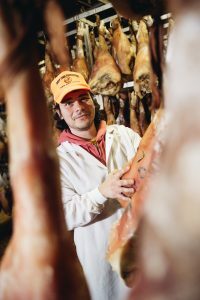 A former vegan turned pork enthusiast, he owns Lady Edison Country Ham, a business born out of an appreciation for the way things used to be. Lady Edison offers extra-fancy country ham, a specialty ham unique to the South, and other delicious varieties of pork in a partnership with the North Carolina Hog Growers’ Association, a nonprofit food co-operative. The hogs are raised on pasture in eastern North Carolina at certified Animal Welfare Approved farms. Suchoff, a UNC-Chapel Hill graduate with a degree in mathematics, got his start working in several restaurants in the Chapel Hill area. He opened his own restaurant, The Pig, in 2010 and quickly found success serving up barbecue. 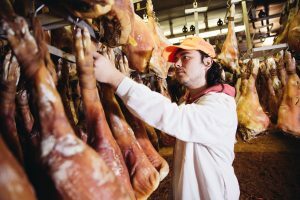 His passion for quality pork led him to establish Lady Edison Country Ham with Rufus Brown, the curemaster at Johnson County Hams. The two had an industry connection before, which strengthened after Suchoff opened The Pig and began buying whole hogs from Brown. “I felt like what Rufus was doing was the most unique,” Suchoff said. Brown and Suchoff’s first product focus was the now famous Extra-Fancy Country Hams that are sold all over the state. Now, Lady Edison supplies several restaurants, including Mateo in Durham and Momofuku in New York. Lady Edison is founded on the values of animal welfare and sustainability. Both Brown and Suchoff appreciate the traditions that family farms have upheld in raising hogs on the ground. When it comes to the food industry, Suchoff sees a case for sustainability in multiple areas. Suchoff said there are areas for the natural food industry to grow in transportation and distribution. Suchoff is doing his part to increase sustainability within his endeavors by piggybacking rides with other distributors and reducing his carbon footprint. All of his business investments — like The Pig, Lady Edison and even a hot dog stand in Carrboro’s Weaver Street Market — have sustainable practices at the core of their operations and will continue to do so, Suchoff said. He has plans for more quality food ventures and is working on an upcoming bar featuring charcuterie or cheese plates and a processing facility. While Suchoff has experienced the challenges of running a business, he continues to enjoy the entrepreneurial process. Chapel Hill residents can taste the difference at The Pig or order products straight from the Lady Edison website.